Retired FBI psychologist Roy Neely is offered a new challenge by his friend Eric Holloway, the director of operations at the CIA. The expanding influence of the Taliban in Pakistan and Afghanistan has raised questions about its influence in neighboring countries. A particularly sensitive area is Kashmir, the source of conflict between India and Pakistan since the end of World War II. The president wants a briefing on the situation in Kashmir and Holloway needs information from a trusted source. Holloway asks Neely to go to Kashmir and investigate the rumors about the Taliban’s influence. 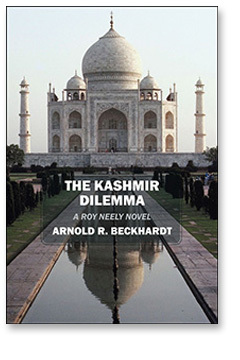 Neely travels around Kashmir posing as a published travel author. But his travels are interrupted by the news that a CIA agent who had infiltrated a Kashmiri freedom fighter group has disappeared. Neely is directed to find the missing agent and bring him back to the States without creating a major disruption between Pakistan and India. The assignment draws him into Kashmir’s complicated political situation and long history of corruption. All content © Arnold R. Beckhardt.